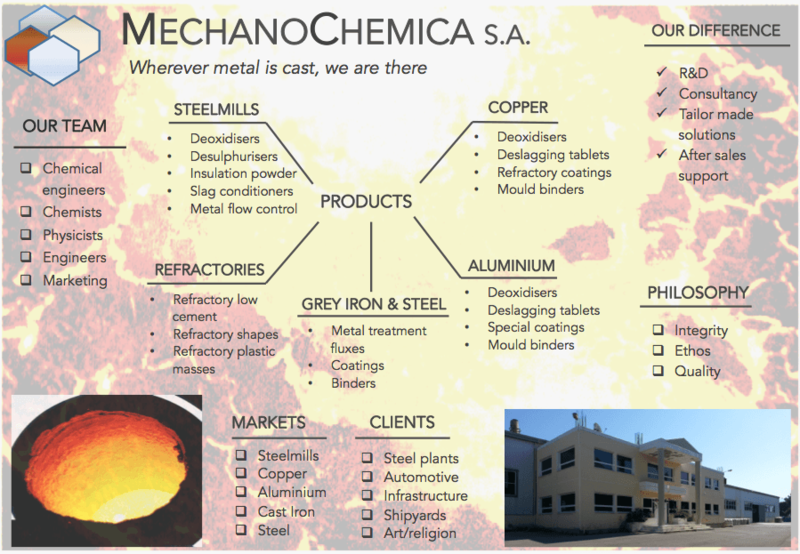 MechanoChemica S.A. is a Materials Technology and Engineering Company based at its own plant premises at Oinofita Viotias, 55 km North of Athens, Greece. The Company was founded in 1979 with main activities in manufacturing metallurgical chemicals and special refractories for the Steelmills and Foundry Industry and since then it continues to serve the metallurgical industry, providing high quality and reliable collaborations. Wherever metal is cast, MechanoChemica is there with products that will assist the metallurgical industry to produce sound, defect free castings. Our team consists of chemical and mechanical engineers, chemists and physicists that apply their skills and knowledge to deliver excellence and innovation whilst our sales and marketing team ensures reliable relations and opportunities. MechanoChemica offers a vast range of products for efficient ladle furnace secondary steel metallurgy, tundish continuous casting consumables, foundry liquid metal treatment and casting for steel, grey iron, aluminium, copper and their alloys. MechanoChemica S.A. also has an engineering branch which manufactures advanced, two-stage fermentation reactors for the vinegar industry. MechanoChemica S.A. aims to provide the metallurgical industry with high quality products and solutions for the smooth and cost effective running of their manufacturing processes. As a company, our philosophy is anthropocentric and customer satisfaction is the key point of our policy. For this reason, we work passionately to deliver high quality, good pricing and in-depth consulting to our customers, respecting the uniqueness of our sector and the challenges that arise in it. The Company's vision is to participate in the future steps of the evolution of the metal industry and help create better castings that will support future generations, technologies and ideas. Metallurgy has been a part of human civilisation since time immemorial. Combining its wisdom with modern science and technology, we envision contributing to metallurgical excellence and inspiring new generations to explore their skills in this challenging sector. The Company is a firm supporter of continuous education and we ensure that all our staff participate in educational courses to further expand their horizons in order to deliver better results and achieve personal development through their work. Being motivated and passionate about our work is what will drive us into the brilliant future of metallurgy and we hope to share this journey with our customers and partners. Key partnerships and collaborations play an integral part in our success and growth. Our raw materials are chosen from reliable supplies who provide optimum quality and pricing. The Company also works in close collaboration with the University of Athens, Department of Chemistry, using their laboratory facilities and equipment to ensure our raw materials comply with our Company's quality assurance policy. Adapting to the ever changing markets, we constantly seek new collaborations, explore new opportunities and look to expand our network.